An osteocartilaginous exotosis is commonly known as an osteochondroma which is a benign bone tumour. Growing tumors might end up replacing healthy tissues with abnormal tissue. It could end up weakening the bone and cause it to break (fracture). Most of the time, the bone tumor is noncancerous (benign), but there are very rare instances where the tumor transforms into being cancerous (malignant). If the tumor is benign, it is not usually life-threatening. A malignant tumor could end up spreading cancerous cells throughout the body (metastasize), which can happen through the lymphatic system or the blood. To gain a better understanding of a bone tumor, you need to understand the bone anatomy. The skeletons living structure works to support the entire body. Bones are composed of an outer shell that is a dense bone surrounding the honeycomb structure of the softer bone. Calcium and protein make up the bone. If bones don’t have calcium, they will end up becoming weak. Axial skeleton – The axial skeleton has 80 bones in total that include the chest, skull and spine. Appendicular skeleton – This skeleton has 126 different bones including that of the limbs, hands, feet and pelvic girdle. 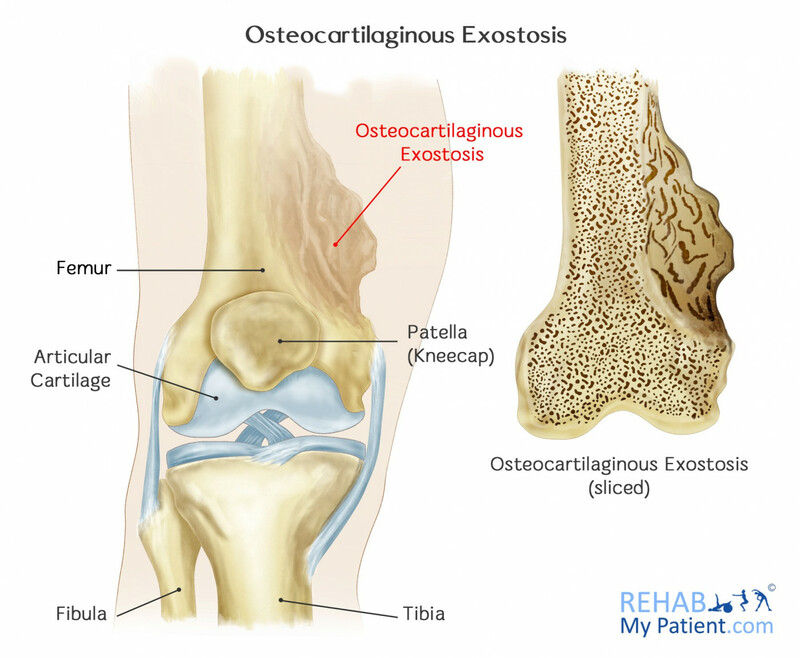 How Do You Know if You Have an Osteocartilaginous Exotosis? First think to yourself, how did the pain start? Was their a logical reason (e.g. a trauma, accident or injury)? If there was no logical reason and the pain came on gradually, a bone tumour is more likely. Secondly, you may also have one of a number of other symptoms association with it such as an unrelenting pain, deep bony pain, night pain, pain that is unaffected by position of your joint, and weight loss. How May It Be Treated? When it comes to eliminating cancerous cells and shrinking tumors, radiation therapy utilizes high-dose x-rays to do the job for you. Based on your individual case, the treatment plan and amount of treatment needed will vary accordingly. This form of treatment kills the tumor cells that have spread into the blood stream but are unable to be detected on scans and tests. Chemotherapy is often used when the cancerous tumors have an increased likelihood of spreading into other parts of the body. Most of the time, a malignant tumor can be removed through surgery. Often times, chemotherapy and radiation are used along with surgery to treat the tumor. If the tumor has grown to the extent that it is too large to treat in another manner, amputation will remove all or part of the arm or leg where the tumor is located as well as remove the blood vessels and nerves involved. This particular surgery removes the cancerous portion of the bone but keeps all of the nearby muscles, nerves, blood vessels and tendons. If possible, the surgeon will take the tumor and a portion of the healthy tissue around it out. A bone transplant will replace the excised bone. After treatment for the tumor, additional x-rays and imaging studies will be performed to confirm that the tumor was fully eliminated. Making regular visits to the doctor for follow-up after your treatment is necessary. Once the tumor disappears, you need to monitor the body and have regular check-ups to ensure that the tumor does not return. Metallic implants are being studied to allow for better functioning and durability after surgery where the limb is salvaged. Clinical research trials might be available in the area to provide you with new therapies and provide you with a better outlook.